It seems March 15 to May 31 is one big conference. While lots of people are making the gas stations and airlines happy I haven't needed to leave NEPA to have a conference-a-thon. I have been spending weekends writing, freshening up and targeting presentations and weekdays delivering. Cutting edge and let me check the law today before I speak tomorrow for HR and different tweaks for students, job seekers and seniors. How do I know if it's gone well? Many times after a seminar attendees stick around and ask questions and I always stay around until they have all been answered. I look at the evaluations to see how well the content resonated and if there are suggestions for next time. 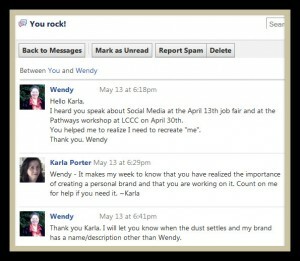 But for me the real feedback comes from what happens in the days and weeks after the presentation. I feel I have done well when people connect with me and want to stay in touch. I get a lot of technical questions on how to do this or that and I get plenty of requests for one-on-one sessions and people asking to tap into my network. I think that's fantastic, and it shows the experience met or exceeded their expectations. 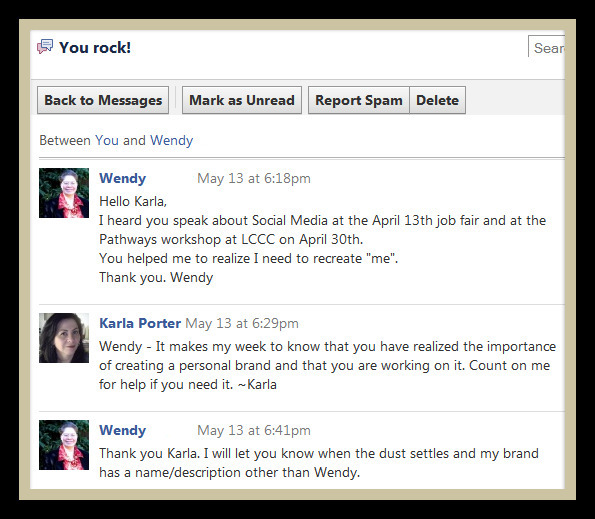 So, when Wendy sent me the message in the screenshot today on Facebook it struck me that she didn't want anything other than to tell me that she realized the importance of what I presented and made a decision to implement the strategy. I offered further support and she wrote back that she wasn't looking for me to do the work for her but she would let me look at it when she has it up and running. A huge smile came to my face, she got it.